Use your head -- not your heart -- when it comes to extreme market corrections. The Dow Jones Industrial Average fell 831 points on Wednesday, the Nasdaq fell almost 4.5% and the S&P 500 dropped more than 330 basis points. That's not including how the indices have done over the past few sessions as well. That type of action makes investors feel pretty squeamish. TheStreet's own Jim Cramer has said repeatedly over the years that nobody makes a dime by panicking. That's true. When emotions set in - particularly panic - logic gets thrown out the window. Earnings, valuations and dividend yields don't matter. High-quality stocks get thrown out the window with low-quality names, until investors have finally exhausted themselves. Being prepared is one thing, but what do you do once the market has already begun to puke? Stay calm. That sounds cliche, right? But the one thing that's going to eat investors up the most is throwing out their favorite stocks as the market hits a slippery slope. But this doesn't mean we should not "stop out" of positions. By all means, investors should honor their trading plans, stop-losses included. But when volatility is flying and stocks are tanking, don't just go in your brokerage account and clean house for the sake of it. Investors should keep the CBOE Volatility Index (VIX.X up on their screen. Generally speaking, the VIX does not spend much time below $10. 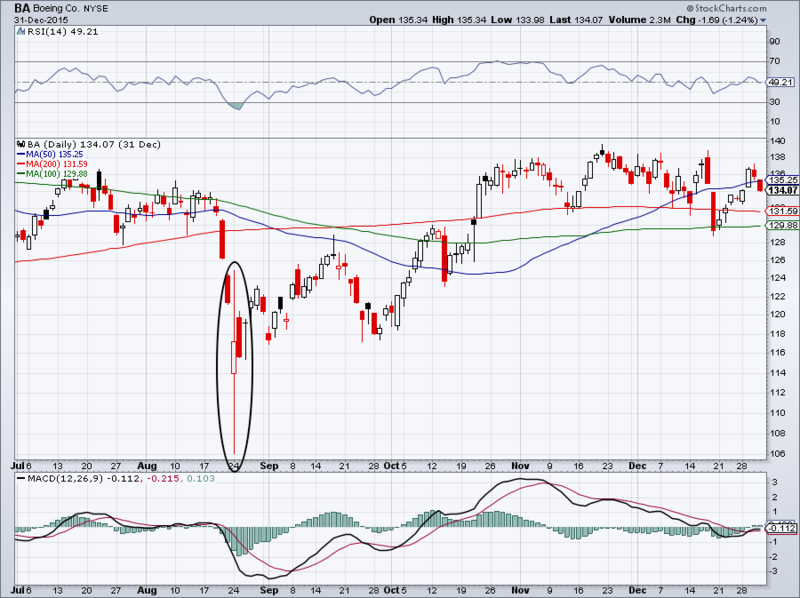 Below that mark suggests that volatility is likely to pick up in the not-too-distant future. 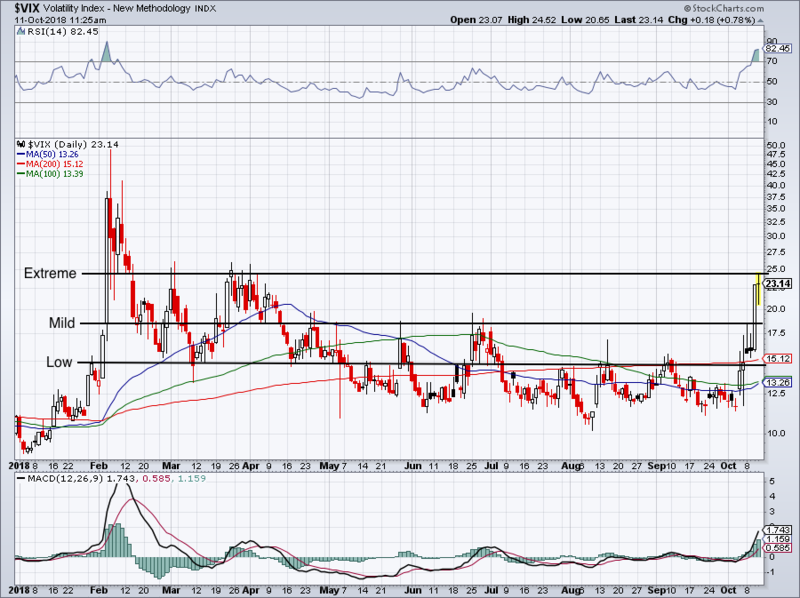 However, knowing whether the VIX will climb to $12 or $13 vs. rocket to $25 - as it did - is hard to predict. Instead, know what the environments are like and when we've hit an extreme mark. For instance, over the past year, we've had runs up to the $17 to $18 area. However, those rallies have mostly fizzled out, meaning the markets were only experiencing mild volatility. This chart is subject to change in the future, but based on the current environment, it looks something like this: Below $15 we have low volatility. 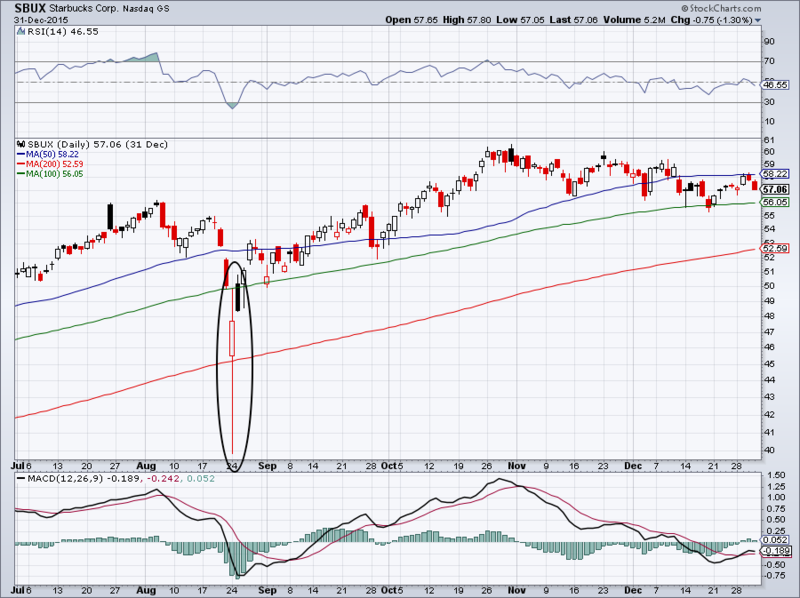 Between $15 and $18 it's mild volatility, but over this mark it becomes heavy volatility. Above $25 and it becomes extreme volatility. Runs to $35 and above indicate pure panic and market-crash environments. Rarely have we been able to sustain these types of levels on the VIX, particularly during an economic backdrop such as the one we're currently in. We just saw the Dow fall 830 points the other day. Who's to say it won't fall 1,000 points on Monday or Tuesday? It's possible - anything is. Especially these days now that algorithmic trading can drive the market in any direction it desires. That's where limit orders come into play. It's always good practice to use limit orders over market orders (here's the difference). By using limit orders, we choose what price we're willing to pay. We don't let the market choose. Amid the chaos, we can look at premarket pricing and futures trading. If we have a huge down opening headed our way, like the August 2015 flash crash, or we get a mini-crash into the close, there's a smart way to pounce on these "best-case buys." Place deep out-of-the-money limit orders. It doesn't have to be portfolio altering or akin to pushing all the chips into the middle of the table. Instead, say Amazon (AMZN - Get Report) is on its way to crashing to $1,400 or $1,500. We could put in an order to buy a few shares or add to our position. That might not even be 5 shares for some investors, but that's OK. The point is to get "lucky" by plucking a few long-term holdings at extreme discounts. What about Salesforce (CRM - Get Report) at $110 or Apple (AAPL - Get Report) at $190? And I mean that from today's prices, happening in rapid succession. Not what happens if the market grinds lower for the next few weeks. Amazon, Salesforce and Apple are holdings in Jim Cramer's Action Alerts PLUS member club. Want to be alerted before Jim Cramer buys or sells AMZN, CRM or AAPL? Learn more now. Even the PowerShares QQQ ETF (QQQ - Get Report) isn't immune. These big drops in August came from the flash crash. 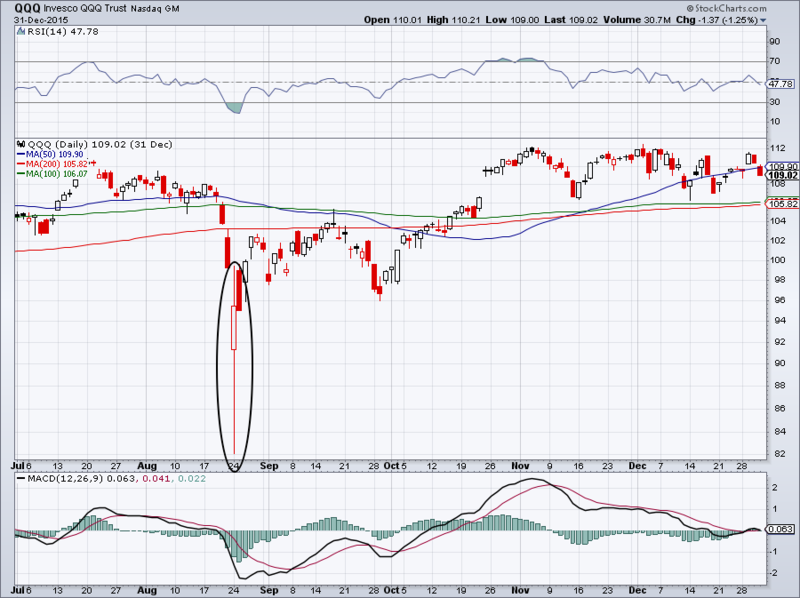 But look at the QQQ's, a proxy for the Nasdaq, down 25% in a few days. No way. Remember that when stocks are being purged, volatility runs rampant. That means implied volatility is running, making options expensive. That doesn't mean investors shouldn't buy calls or puts necessarily, but just understand that they will be more expensive as a result. Also remember that there can be a lot of chop, hurting those near-dated contracts more than long-dated options. Also keep in mind that this will make options premiums more attractive when selling them (i.e., taking a long position via a cash-secured put). If traders aren't fluent in options, starting amid a pullback like the one we're in isn't the time to learn. I get it. When the market's moving fast and your hard-earned dollars are on the line, it's easy to get emotional, defensive and look to save what you still have left. But more times than not, the decisions made with our heart and not our head lead to regret down the road - at least when it comes to business. Instead, be disciplined during big rallies. When the markets start to roll over and step on the throttle, don't throw out your good stocks unless you're truly done with them. Otherwise, you'll just regret selling Nvidia (NVDA - Get Report) at $205 and having to buy it back higher like so many did this year. If you miss your chance to sell, don't panic. And once we've had some big down days, look for potential bargains, especially for long-term holdings.